The ILPS in Canada supports democratically-elected President Nicolas Maduro and the valiant efforts of the people of the Bolivarian Republic of Venezuela to defend their country against the blatant imperialist interference led by Washington in the internal affairs of their country. The ILPS in Canada denounces the decision by the imperialist Canadian government, mimicking the reactionary Trump administration, to support the self-declared “interim president” Juan Guaidó. A member of local elite and the far-right Popular Will party, Guaidó was virtually unknown in Venezuela until a few weeks ago. He has no popular support and is simply a vessel for the imperialist conspiracy underway. Guaidó has already announced plans to de-nationalize the state petroleum firm, Citgo. Venezuela has one of the largest oil reserves in the world. This extra-constitutional regime-change manoeuvre was obviously orchestrated by the Trump administration and its loyal lackies in Ottawa given their immediate uncritical support for Guaidó. It follows an unsuccessful coup attempt on January 21 by a small group from the National Guard who had reportedly been offered payment. The 25 instigators are in custody and the armed forces have reaffirmed their loyalty to President Maduro. We join anti-imperialist and democratic forces all over the world and progressive-oriented governments in Latin America in condemning these despicable acts. This is not the first time coup attempts have been made. In 2002 millions of Venezuelans fought to restore Hugo Chávez to the presidency within 48 hours of an attempted coup, showing the world the power of the people to fight back. 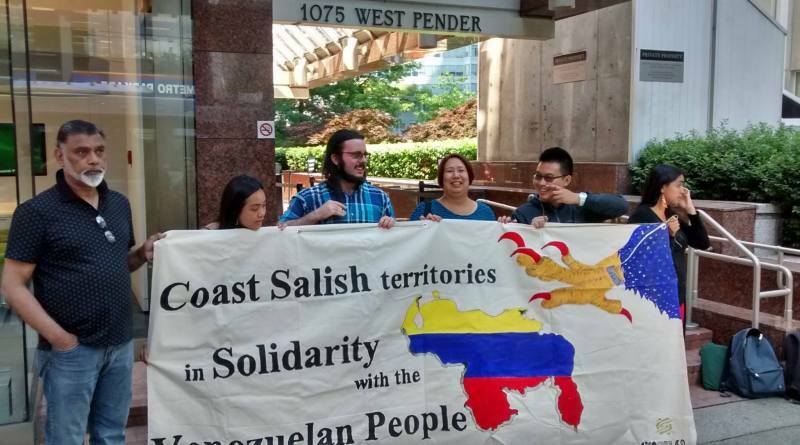 At this critical time, ILPS in Canada members are invited to organize and join actions to support the people of Venezuela as they struggle to build an fair and just society based upon the concepts of the Bolivarian revolution. All this in the face of imperialist threats and financial and economic sanctions meant to punish the Venezuelan people for daring to build a society that refuses to obey the dictates of Washington and company. The government of Canadian Prime Minister Justin Trudeau has also imposed targeted sanctions, and has barred the Venezuelan Ambassador from returning to Canada. Recent events in Venezuela follow the swearing in of President Nicolás Maduro for a second six-year term in office on January 10, 2019. President Maduro was re-elected last year with 67 percent of the vote in an election that was judged to be free and fair by independent observers. There was a 46% turnout at the polls despite a boycott by the main opposition right-wing parties. Maduro’s inauguration was attended by scores of international guests, including heads of state from Bolivia, Cuba, El Salvador and Nicaragua as well as high-level delegations from China and Russia. President Maduro has earned the ire of the US and the local reactionaries for upholding the legacy of Hugo Chávez in implementing social and economic reforms that benefit the broad masses of the people, particularly the toiling masses of workers and peasants. US imperialism cannot forgive Chávez and Maduro for nationalizing the oil industry that it greedily covets. Likewise the local oligarchy cannot forgive Chávez and Maduro for using the oil profits to build schools, hospitals and clinics, low-cost housing and other progressive programs for the broad masses of the people. Despite the imperialist propaganda offensive, financial and political support to the so-called opposition, and threats of outright military intervention, the overwhelming majority of the working people of Venezuela have stood firm, realizing that the serious difficulties in Venezuela are due in large part to Washington’s harsh economic and financial sanctions. They want no part of a return to the neoliberal policies promoted by the elite-dominated opposition that devastated the poor people of Venezuela during the decades prior to Chávez’s election in the late ’90s. Again we condemn this further attempt by the US and the local reactionaries in Venezuela to overthrow the Bolivarian Republic of Venezuela and reverse the patriotic and progressive Bolivarian orientation of that government. We extend our solidarity to the Venezuelan government and people and support their right to national self-determination and to chart their own independent course of development. Down with US imperialism and its local proxies! End the sanctions against Venezuela!